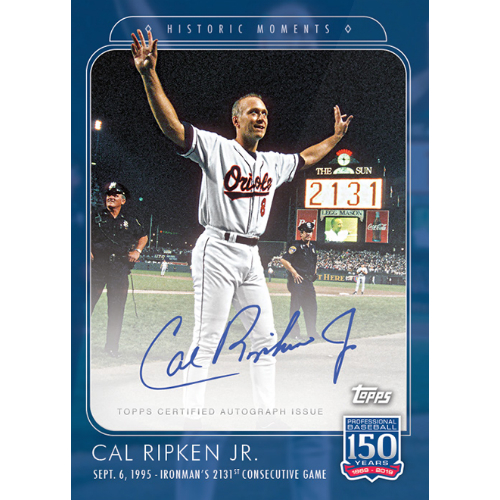 The third week of the Topps 150 Years of Baseball on-demand series includes the set's first variant, a Ripken autograph, as well as cards commemorating two greats from the Red Sox and Giants. These cards, available between March 19 and March 26, 2019, are limited printings based on sales. A full checklist for this set can be found under the main product tab at the top of this page. This week's checklist is below. This card uses the set's "Records and Award Winners" headline to highlight Yastrzemski's 1967 American League MVP award. Yastrzemski played 23 seasons in Boston but his 1967 campaign was something special. That year, playing in 161 games, he earned a .326/.418/.622 batting line with an OPS of 1.040. He had 189 hits, 112 runs 121 RBI, 44 home runs, and only 69 strike outs in 680 plate appearances. His 12.5 WAR was the highest in the American league, as were his 1.7 dWAR, batting average, OBP, SLG, OPS, hits, total bases, and runs scored stats. 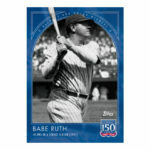 He won the Triple Crown, MVP, Gold Glove, and earned his fourth of 18 All Star appearances. 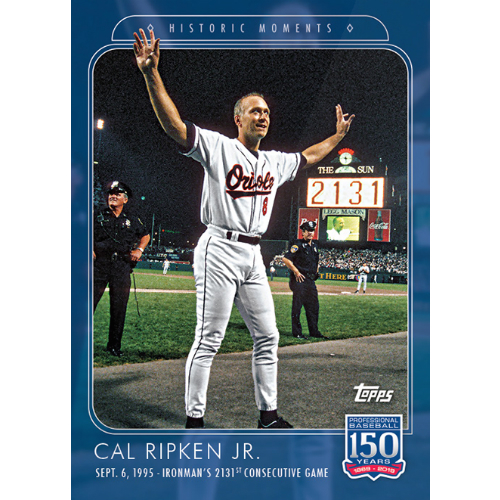 Released with the "Historic Moments" banner, this card commemorates a moment every baseball fan remembers - Cal Ripken Jr's 2131st consecutive game. The feat happened on September 6, 1995, nearing the end of his 14th full season with the Orioles. He would add 501 games to that record over the next 3+ seasons. There is not an active streak within 2,000 games of Ripken's record. This card also marks the first variant as a series of Ripken autograph cards are included in the series and available for purchase in extremely limited quantities. 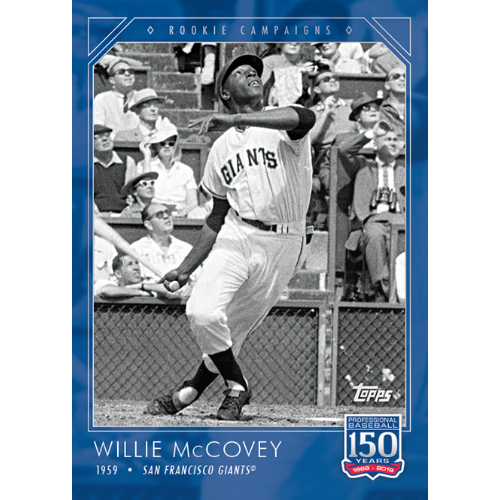 The final card in this week's release honors Willie McCovey's rookie season in 1959. 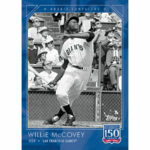 Appearing in only 52 games, McCovey had a batting line of .354/.429/.656, with 68 hits, 13 home runs, and 38 RBI. He won the Rookie of the Year award and finished 22nd in MVP voting -- with only 52 games played. This was not an early peak, though, as he would go on to appear in six All Star games and finish in the top 20 of MVP voting eight times, winning the award in 1969. 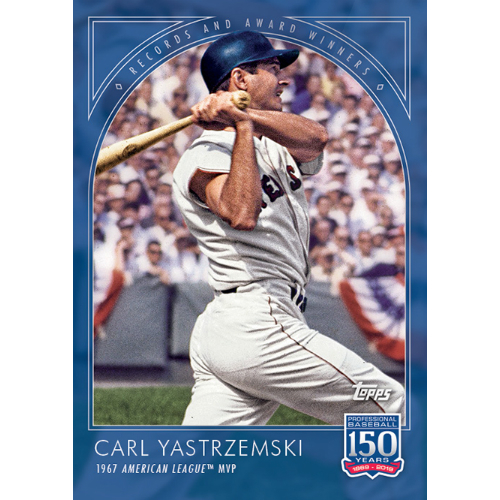 Oh, and he hit 521 home runs along the way which, as of the time of this card's release, still ranks him in the top 20 of all time. Use the links in the sidebar or below to purchase your copy of these cards while they are still available. Final print runs will appear on the checklist when they become available.